Whether Ohio State will actually get to, or deserves to play in, the BCS Championship is a debate we only have to endure for a few more months. Nevertheless, OSU is undefeated and Alabama no longer is. 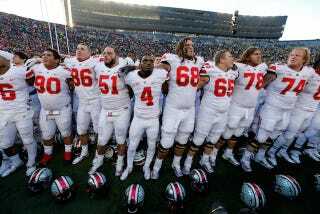 The Buckeyes are in a better position than they were when they barely survived Michigan and they're pumped up. Wide receiver Frank Epitropoulos filmed the team's reaction to the final play of Alabama-Auburn on the bus ride home. Let's enjoy unbridled joy.